Sukkot is the time on the Jewish calendar that is called z’man Simchateinu – the time of our joy. As we head into the final two holy days of Shemini Atzeret and Simchat Torah, I look back and see that it has been an incredibly joyous week here at the Orangetown Jewish Center. I could say that the joy has been thanks to the perfect weather for sukkah sitting or due to our beautiful new sukkah filled with the decorations of our children. But most of all, the joy is thanks to the amazing people of our community. The festival days were uplifting as congregants paraded for the Hoshanot with our lulavim and etrogim. The Shabbat during Sukkot was filled with happiness as we kicked off Shabbaba Shabbat [for ages 0 to kindergarten every Shabbat at 11:00] and Family Congregation [for grades 1 through 6 every Shabbat at 10:30]. When all those little ones joined the rabbis on the bima for Ein Keloheinu, it was a snapshot of the OJC community at its best. Young families had a sleepover at the synagogue on Saturday night, and on Sunday we had a full day of Sukkot activities, culminating in our annual sukkah dinner with almost 200 people celebrating together with Amichai Margolis and the Orangetones! During the intermediate days of Sukkoth, we say Moadim l’simcha (may your intermediate Sukkot days be joyous)and we really mean it! As I told the children of our religious school yesterday as we hopped from sukkah to sukkah in our neighborhood, these days are intended to lift us up out of our everyday lives into something more. And then came this morning which began at 6:45 with the service for Hoshana Rabbah. Traditionally, we chant hallel, read from the Torah, and march for our final time of this Sukkot with our lulav and etrog around the sanctuary, this time seven times. This morning, however, we had just five people; that is, half a minyan. I considered feeling disappointed, but I thought back over the many congregants who had enjoyed part or all of the Sukkot celebrations all week. I decided instead to energized and dedicated to continue spreading the word of Jewish observance and celebration. Prayer minyans and holy day experiences in a Conservative synagogue are indeed a challenge, but I know that we can continue growing as a community. Even if I wanted to feel disappointed that we were not able to have the Torah reading or open the ark, the five of us who were together in the sanctuary felt united in the holiness of the moment. There was not room for disappointment in the midst of the joy. One of the most curious rituals in Jewish life takes place at services for Hoshana Rabbah as we beat willow branches, shaking free the leaves. As the leaves fall, we pray that our mistakes of the past year will be completely forgiven. In our synagogue, the willow branches are collected and wrapped artfully every year by a congregant who learned to do this when he was a young boy in Lowell, Massachusetts. 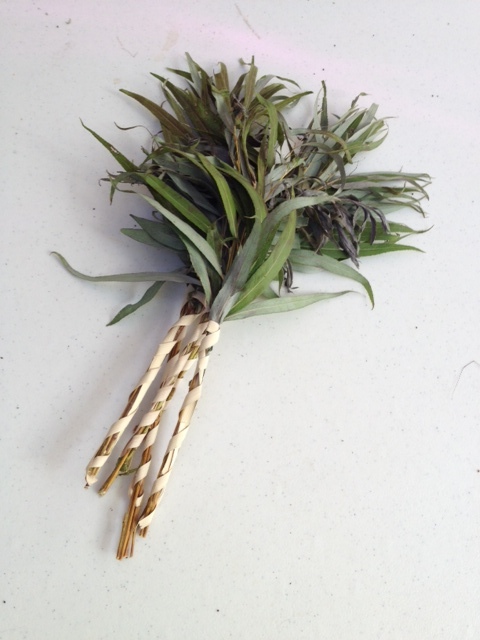 He wraps small bunches of willow branches binding them together with a beautiful braid of palm. He creates these ritual objects with generosity and delight. How could I think about being disappointed if he wasn’t? When we finished the Hoshanot prayers, an older member of the minyan led us in a small circle dance. Certainly, our small group of five this morning was just as pleasing to God as the 200 people gathered in our sukkah this past Sunday night. There is something grand to be said about a vibrant community that celebrates together across the generations as we did during the first days of Sukkot. But there is also something to be said for a community that accepts its responsibility to support our minyanim day in and out. May we all continue to enjoy the privilege of rejoicing in our Judaism and accept the responsibility of fulfilling our obligations. I hope to see everyone tonight through Shabbat evening for a celebration at the end of Sukkot, finishing the Torah and beginning again. May this holiday season bring us great joy.